I did it! I ran the Manchester marathon. And it was one of the most rewarding experiences in my life. The last seven months of training have taken me on the most incredible journey. It started on my cheap treadmill in a corner of our sitting room and ended under that Finishing line in Old Trafford. I raised over £700 for Cancer Research. And I went through everything that most runners experience at some point of their training – aching calves, tiredness, anxiety, doubts and most importantly battling with my own mind. It is the psychology of marathon training that I found hardest of all. It’s all in the mind – that’s pretty much all the information on the subject given to most runners about the marathon. But there’s very little real advice about how to control your mind, how to get up day after day, week after week, overcoming the mental effort of putting on your trainers in freezing cold weather, battling through wind, rain and snow. How to push through the pain barriers and most importantly, how not to cross that very fine line between pushing yourself a little further however much it hurts, without actually injuring yourself. 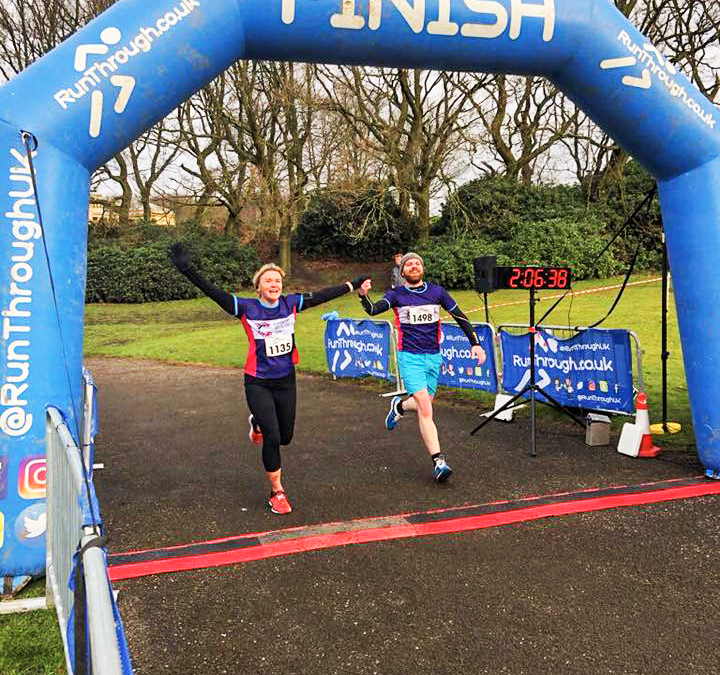 I stopped writing my blog after my second half marathon at the end of February. I was in a lot of pain and began to suffer depression. With just five weeks to go to the full marathon I managed to give myself a massive build up of lactic acid in both legs. The day of the half marathon was freezing cold. I had a very emotional argument 15 minutes before heading to the start line. I was upset and after the gun went off I found myself running fast, too fast for my fitness level. It was the hardest run of my life. I finished it with my personal best but I hated it. Next day I couldn’t even walk down the stairs. What seemed to me to be an excruciating pain lasted for over three weeks. I was trying to self diagnose and I also had several therapists looking at it. There was no obvious injury. But I couldn’t run. Both of my shins and calves hurt so badly. Psychologically I felt even worse. I felt I had mentally failed even before I went to that Start line and it wasn’t really clear why. Was marathon running simply too much for me? Most of my friends were saying I needed to rest. But the days and weeks were ticking by and I knew if there was any chance of succeeding I simply had to keep going. It wasn’t until I talked to some very experienced marathon and ultra marathon runners that I managed to pick myself up and push through it. I literally cried in pain as I continued running by myself slowly through Heaton Park. Was I going completely mad? I stuck with my excellent sports therapy and suddenly one week before the marathon I started to feel better. I could run again. I wasn’t able to complete my marathon training plans and I didn’t do all the necessary mileage but I did feel confident enough to go for it and give it a try. For no other reason apart from the fact that the costume was available in my daughter’s dressing box I dressed as a unicorn. I thought if I can’t run fast at least I will have some fun. And it was the best thing I could have done. On the day of the marathon suddenly all the pain was gone and I ran. The feeling was one of overwhelming happiness. People on the street were giving all the runners the most incredible support and when children saw my funny costume they shouted “unicorn, unicorn” – they smiled, they waved and lined up to high five me. I was shaking their little hands, taking pictures with them, I didn’t really care much about my time but still managed to arrive in 4 hours and 33 minutes, faster than I expected. So what did I learn overall in last 7 months? You can do anything if you set your mind to it. Follow the advice of those who have done it, are better than you and know what they are talking about. Get sports therapy that works for you. Yes, you will of course lose weight but that becomes a secondary thing. Most importantly understand that the pressure is not just on you but also on your family who has to live with your marathon “madness” without having the same excitement as you do. Marathon training is a test for your body and your mind. You have to learn how to manage both. But strong ones always survive. And become better. So, keep running and enjoy it! 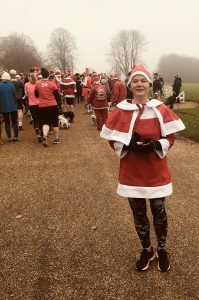 My husband says I whinge a lot in my running blogs so I held off writing for a few weeks as it would be nothing else but more and more whinge. How I ache. How I am tired. How slow I am! 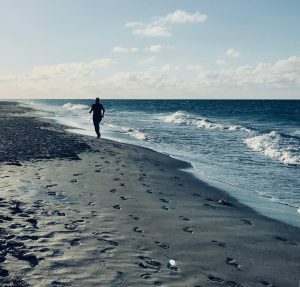 The photo above that my husband took was the first and the last time I actually ran on that beautiful beach. We’re now back in cold and rainy Manchester and I have January blues. I keep up my training but don’t see much improvement. My osteopath colleague Francis sorted out my knee for now. But I am still the slowest in my running group. I feel like dying each time I sprint up a hill. I hurt in places I didn’t know I had places! At my current pace it would take me about 6 hours to complete the marathon. Depressing thought… I have to speed up somehow. So I keep going. More hills. More speed work. More cross country and more press ups on park benches. And despite all my whinging, rain, hails and cold wind I really really do love running and I am still very excited about this marathon. Heaton Park, December, 7pm. The coldest day of the year so far. It was dark, freezing and I could see nothing. Out of the gloom barks a voice. ‘Take cover!’ and I stare into the nothingness like a rookie soldier entering a battlefield. ‘Down, get down and crawl’ shouts the guy next as he taps me on the shoulder. I actually find it easier to crawl up the dark wet hill then sprinting up it. But my hands are now really hurting from the bitter cold. ‘Good effort, Martina, good effort’ – cheers our instructor as I puff and pant my way to the highest point in Manchester. ‘Welcome to BMF’. I feel I am going to faint from exhaustion and hope that the huge green rucksack he always carries with him contains a CPR kit. The comparison with a battlefield is an apt one as I’m on one of the many gruelling exercise regimes I’ve ever taken part in. It’s run by British Military Fitness. I saw them in Heaton Park as I was leaving from one of my regular Saturday park runs. Large groups of people in blue, red and green vests sprinting up and down steep hills and in between doing press ups, jumping jags, lifting large tyres and wooden logs. 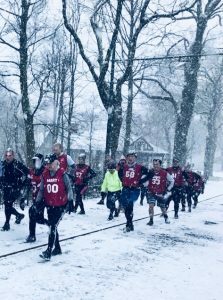 Come rain, shine or sub zero temperatures they turn up 5 days a week to go through a punishing exercise regime. When one of my runs was cancelled due to appalling weather they were there. It was then that I masochistically decided that that was what was needed to get fit for my marathon and if that type of determination and fitness level won’t get me ready for it, nothing will. BMF runs classes and running clubs in all major parks around the UK so I signed up for a free class. I was very excited prior to it and absolutely exhausted when I finished. I couldn’t see where I was stepping. I just felt my legs constantly entering puddles of icy water with muddy slippery grass under them. There was no longer any point in avoiding them. It was just easier to get through them without overthinking it, otherwise I fell too much behind and felt as though I was letting the group down. Of course afterwards I headed straight to bed after long hot bath yet somehow I felt stronger the next day and my next run felt much easier. So now I’m hooked! I train with BMF on weekends in the morning while my husband and my daughter supportively cycle around the park waiting for me to finish. At least that’s what they tell me. I suspect however while I am throwing myself onto wet freezing grass doing press ups they head straight for the Stables café for bacon sandwiches and hot tea as they always look warm and contented when I arrive home red faced in soaking wet kit. I now go out and run five times a week. I run hills. I run intervals. I did my first cross country 10k race. I am still very slow but who cares? In any case I managed to break my 30 min barrier for 5k this weekend with a time of 29m:27s. I did my first 15k on Sunday. My legs hurt sometimes but these little milestones are so rewarding it’s all-worthwhile. I did my first 10k race this weekend. After a few 5k runs I couldn’t imagine myself doubling that distance especially after a long difficult week at work. The fact that I’d not managed to train at all during that week filled me with horror. The run was in aid of men’s health. Mo runs take place all around the country at this time. Fancy dress is of course encouraged and after donning a rainbow wig and paining on the obligatory handlebar moustache I felt silly enough to tackle anything. Here’s the thing, my time was only slightly slower than 2 x 5ks which only serves to destroy the myth that a break from training is a bad thing. In fact the experts tell us that providing the break is a sensible one, far from damaging the regime it actually gives the body time to recuperate and regenerate, making further demands on it actually easier! I have tried really hard over the last 3 weeks. The first week was very exciting and I felt full of energy. The second one I felt I needed to try harder. And the last one was a struggle to just keep going! My biggest achievement was to leave my treadmill and finally get myself out to the park. 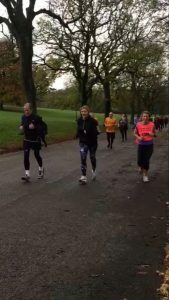 I joined a 5k park run on the Saturday morning at Heaton park. Park runs take place all over the country on Saturday mornings and are a great (and free) way to get fit by running with people of all abilities. The night before I was so nervous that I could barely sleep. I woke up early on Saturday to get myself ready but was so full of nervous excitement I faffed around and almost missed the start. I had to take a short cut and run across a muddy hill. By the time I arrived at the start line my trainers were soaking wet, I was covered in mud and I was freezing cold. I didn’t know what to do with the barcode I was given. I forgot to charge my Fitbit so it stopped working halfway through my run. I left my headphones in the car so I couldn’t listen to music but I ran and loved it! The morning was damp and wet so I was staggered to see over 600 people taking part. There were folk in trick-or-treat costumes, (It was Halloween) people with dogs, babies in prams, children running with them. People of all ages, shapes sizes and abilities. There were supporters on the route and on the finishing line. My husband and my daughter were waiting with smiles on the finishing line – after they enjoyed their breakfast in local café while I took almost 35 minutes to complete my first 5 k run. I ran faster the second weekend and faster still on the third, although it felt the hardest. 31 min and 20 seconds to complete 5 k course. During the week I still run on my home treadmill as I am trying to fit my runs alongside a busy schedule. But gradually I will try to replace it with running outdoors as much as I can. We all know that running outdoors is much more beneficial and much harder. According to runner’s world magazine, treadmill belt assists leg turnover, making it easier to run faster. So most of us find that our pace on the treadmill doesn’t correlate to our road pace. Also, some of the soft tissue conditioning or “hardening” that occurs with road running does not occur with treadmill running because the plate or base on the treadmill “gives” more that road surface. And obviously there are no weather conditions to deal with when running indoors. The advantage of the treadmill is that because it is easier to run on it, it is good to use it for speedwork using faster and slower intervals but nothing can beat the shared thrill of running in a large group. I have signed up for my first 10k race next Sunday and I must admit I am worried but excited about it the same way I was about my 5k run. I just hope the weather will be kind to me! Everybody around me was sneezing, coughing, and blowing their nose. I thought I’d got away with it but just as my family were recovering the dreaded virus struck! I tried to keep my exercise regime going for a while but in the end had to give up for a week while I recovered. I felt weak when I started to run again and I was sweating a lot. But I am doing better now. I can run 10 k. I am slowly speeding up to 8.5 km per minute. I feel stronger than before. And I am steadily losing weight. I was trying to work out what to improve first. Distance or speed? There is a saying that when it comes to training, we can use the analogy of baking a cake; we all need a strong sponge (aerobic base) before we can start with the icing and decorations (speed work). And long distance running is very much an aerobic event. So we need to prime our aerobic energy system and our body to be able to run for an extended period of time. So I am aiming to spend next few months gradually increasing my mileage and to condition my body to a greater volume of running. I am not going to worry about the pace too much for now. I just need to run and get that mileage into my feet. I will do my best. Have a lovely week everybody and very good luck to all of you who are running Manchester Half Marathon next Sunday! I will be thinking of you all. I did it! I ran for an hour and hit my target for the week by increasing my speed from 6 to 8 kilometers per hour. I know I’ve basically gone from a brisk walking pace to a slow jog but baby steps for now to avoid injury! It was hard at first but ok the following day. I even managed to fit in my favorite Zumba and Pilates classes with the lovely Jess in Prestwich. There wasn’t too much pain and I thought I was doing so well until I stood on my scales. Despite all my effort and expectations I was couple of pounds heavier. Surely after all that I should begin to lose weight? So I did some research and realized I made a very common mistake. I exercised more and therefore I thought I could get away with all those lovely cheeses, white bread and peanut butter. But I was wrong. According to the Women’s running UK website, the scientists at the University of Copenhagen conducted an experiment on overweight Danish men and women. The participants were divided into three groups. The first group were told not to change either their diet or their exercise regime. The second group were asked not to change their diet, but were asked to do moderate exercise that burnt 300 calories on almost a daily basis. The third and final group were asked not to change their diet but to perform vigorous exercise that burnt 600 calories on almost a daily basis. The study lasted for 13 weeks and revealed some intriguing results. Those who had not changed their diet or their exercise regime had no change to their weight, yet those who performed the more intense workouts lost, on average, two pounds less than those who performed the moderate exercise regime. It is thought that this difference in weight loss came about because those that worked out harder and longer ate more to compensate. It is also thought that those who worked out harder were more inactive in those hours when they were not exercising compared to the ones who worked out less. So despite the increase in my exercise regime I still have to be careful with what I eat. No more lovely Comté for me (or maybe just a little bit sometimes). I am back to a proper protein intake and I’m avoiding empty carbs. I will keep my healthy fats and even the odd glass of wine for now. Next week I want to consolidate my speed at 8 kilometres per hour so I can gradually start building it up. I will run 10k. And I will have to start with interval training to increase my speed and strength. I will try to stretch well so I can avoid all the common injuries. And I really hope that weight will finally start to drop. I will let you know how it goes next week. I’ve always loved to run. Having run in several half and full marathons, by the time I was 40 I’d given birth, developed several prolapsed discs and my running aspirations went out the window as the kilos piled on. 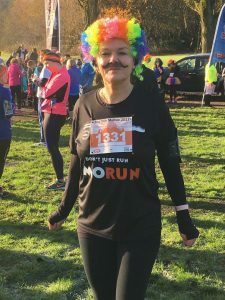 An all too familiar tale amongst women of my age I suspect, I became tired and depressed but on reaching my 50th birthday I decided to run a marathon once again. I signed up for the Manchester run on Sunday the 8th of April 2018 so as of today, have exactly 7 months to prepare and get fit. In this blog I will update you weekly on my progress and hopefully inspire many amongst you to get fit, shed those excess pounds and live life to the full! Confession time. I’m 2 stones far too heavy and unfit to run. My running machine is either lying to me or I can really only manage 6 kilometers per hour. (A brisk walking pace.) At this rate it would take me 7 and half hours to complete the course. The roads in Manchester would be reopening by the time I reach the finish line!But I believe I can do it. My aim is to go from an unfit 50 year old to a happy lean marathon runner. After many years of training I have personal experience of how to prepare for long distance running and as a fully qualified osteopath I understand every bone, joint and muscle in the body. I need to follow my own advice to my patients that aches and pains are sometimes a symptom of simply being unfit and carrying too much weight. Why not do it with me? My first challenge is to increase my endurance from a measly 40 minutes run to 1 hour by the end of this week. Wish me luck. I will update you all weekly and let you know how I am getting on.